13th February 2018 ­– The role of a Data Scientist has been tipped as one of the most in-demand and attractive jobs of the future. With increasingly high competition for vacancies and the suggestion that Data Scientists will be somewhat exempt from the threat of robotic job replacement, job search platform Joblift has analysed the recruiting trends in Data Scientist roles in the UK. The data shows the most in-demand skills (soft and hard) that employers look for in potential candidates, as well as highlighting average increase, salary, and most dominant locations. According to Joblift, 8,672 Data Scientist vacancies have been posted in the UK in the last 12 months. These positions have seen an average monthly increase of 3%, in comparison to a 2% increase in the whole UK job market on average each month. Unsurprisingly, London dominates when it comes to the location of Data Scientist roles in the UK. The capital housed 53% of all vacancies last year, almost 13 times more than second place Cambridge and over 16 times more than third place Manchester. Furthermore, in terms of salary, the study shows that 51%, of the 3,530 job postings that stated a wage, advertised a salary of over £50,000, with an average advertised salary of around £49,000. Only 7% of all job vacancies stated a salary below £30,000, meaning at least 93% of Data Scientist vacancies offered pay significantly higher than the UK’s average wage of £28,600 . Additionally, and as to be expected, Joblift determined that knowledge of programming systems was the most requested hard skill, being mentioned in 83% of job advertisements. Delving deeper, Python, mentioned in 6,334 postings, was the most popular programming language to understand. 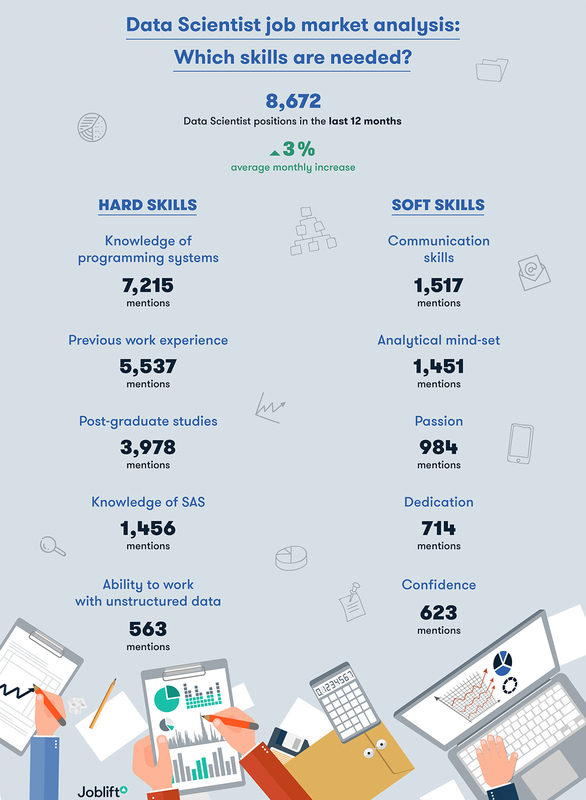 The data also shows that previous work experience is essential for Data Scientist employers (5,537 mentions), as is post-graduate studies. 849 job advertisements mentioned the need for candidates to hold a PhD and 1,342 requested a Master’s degree. Adding to the need for highly qualified and skilled candidates, knowledge of SAS (Statistical Analysis Software) was requested in 1,456 job postings, while the ability to work with unstructured data was asked for in 563 vacancy postings. On other hand, being caring or empathetic (8 mentions), charismatic (7 mentions), people oriented (7 mentions), assertive (6 mentions), and spontaneous (5 mentions) were the least requested skills.